Much of the world will be able to witness a rare skywatching event on June 5, as Venus crosses the face of the sun in a spectacle that will not be visible again for more than a century. But for anyone who is not able to see the so-called transit of Venus in person, there are other ways to catch the historic event online. While observers in many parts of the world — including North America, Europe, Asia and eastern Africa — will be well-placed to see at least part of the transit in person, several organizations are planning to broadcast live views using footage from various observatories and telescopes around the globe. 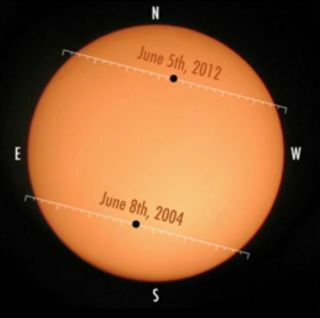 Since the event occurs across the International Date Line, the transit of Venus will occur on Wednesday June 6 in Asia, Australia, Africa, and Europe. The reason for the wide interest in the Venus transit is clear: This is the last time anyone alive today will have a chance to see Venus cross the face of the sun. The next transit of Venus won't occur until the year 2117. Venus transits occur in pairs eight years apart. The last one occurred in 2004, making the 2012 transit the last in the current series. Viewers who decide to tune into a webcast will be able to watch the entire transit unfold, as Venus appears to touch the outer edge of the sun, then travels onto the face, before crossing the inside edge and continuing along its orbit. This image was captured by Marcin Filipek from Poland on June 8, 2004. The Slooh Space Camera will stream ten real-time feeds of the transit from solar telescopes in Australia, Japan, New Zealand, Hawaii, Norway, Arizona and New Mexico. The webcast, which begins on June 5 at 6 p.m. EDT (2200 GMT), will track Venus' entire journey across the sun. The show will also feature commentary from astronomers, filmmakers, science writers, engineers and solar experts. "A few odd phenomena happen during Venus transits, like the 'black drop' that seems to connect the planet with the space outside the sun, which will be highlighted and discussed by our experts as it happens," said astronomer Bob Berman, who will be one of the guests during Slooh's webcast. Another option is the webcast hosted by San Francisco's Exploratorium. The museum will showcase a 6.5-hour live event with telescope feeds from the Mauna Loa Observatory in Hawaii. This footage will be accompanied by audio commentary every 30 minutes, according to officials at the Exploratorium. The Exploratorium webcast will begin at 6:09 p.m. EDT (2210 GMT) and last until 12:49 a.m. EDT June 6 (0445 GMT June 6). People are invited to watch the webcast on large screens at the museum (during museum hours), or online at http://www.exploratorium.edu/venus. The webcast will include interviews with experts and amateur astronomers. Members of the Antique Telescope Society will use vintage telescopes to observe the transit, just as predecessors in the 18th and 19th centuries did. WARNING: For skywatchers who are planning to view the transit of Venus in person, it is important to exercise caution. It is very dangerous to stare directly at the sun. Special eclipse glasses and filters for telescopes are needed to avoid permanently damaging your eyes.